Natural justice and administrative fairness are at the forefront of Ombudsman investigations. Natural justice is to administrative fairness what due process is to criminal law. For example, if an accused is not informed of his or her rights, there is an error in process. Similarly, if an individual who is denied a service is not informed of his or her right to appeal, the process is flawed. An Ombudsman’s duty is to bring fairness to the process, decisions and actions of government. The Ombudsman will consider all factors when commenting on the fairness of government action. The Alberta Ombudsman analyzes administrative fairness in a broad spectrum of decisions that affect Albertans. They range from decisions of an administrative tribunal made with a defined statutory mandate (e.g., workers’ compensation benefits, social assistance benefits and disciplinary sanctions for inmates in provincial correctional centers), to decisions where there is a less formal (or no formal) decision-making process. This includes decisions and actions of frontline employees such as employment standards investigators, day-care licensing investigators, child welfare investigators and vital statistics staff who issue birth certificates. Natural justice is to administrative fairness what due process is to criminal law. Download your copy of the Administrative Fairness Guidelines here. 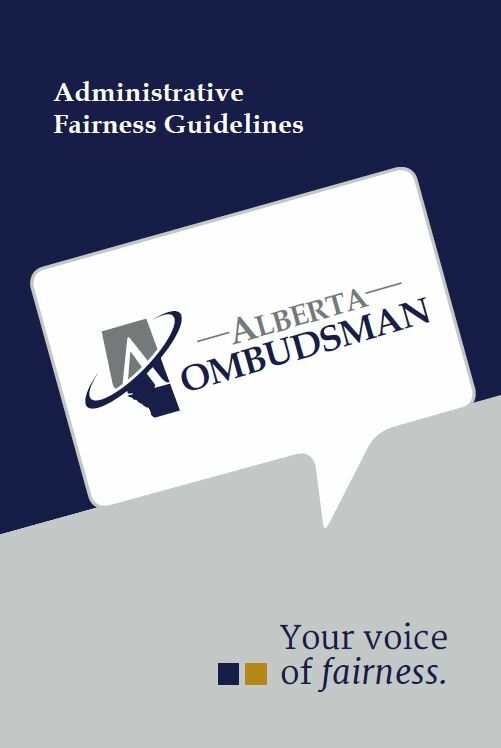 In determining fairness, the Alberta Ombudsman uses the following guidelines to assess whether a situation has been dealt with in an administratively fair manner. What legislation created the authority or power to make a decision, and to which decision-maker was the power granted? The courts require that decision-making which affects the rights of individuals must follow a fair process. This duty of fairness means there must be procedural fairness in decision-making. Was the complainant given a full and fair opportunity to present their case to the decision-maker? Was there full disclosure of the case against the person, to the person? There must be a rational connection between the evidence presented and the conclusions reached by the decision-maker. The decision and the reasons must be communicated clearly and identified by the decision-maker. We look for impartiality and independence of the decision-maker including relationships to all parties in the matter, both internally and externally. Did the decision-maker fail to honour a commitment or follow regular procedures? We look to see how the discretion is established in the act, regulation, or policy guidelines, etc. Discretionary decisions are reviewed to determine if there is evidence of bad faith, improper purpose or irrelevant considerations. A reasonable decision does not equate to whether the decision is wrong or whether it might have been decided in a different way. A reasonable decision should indicate how the decision-maker(s) considered and assessed the arguments and evidence. These eight fairness factors form the nucleus of a procedural guide to the Ombudsman when determining if natural justice and administrative fairness prevailed in coming to a decision. The first step is to identify the legislation that creates the authority or power to make a decision. There are limited exceptions where tracing the chain might not apply. These could include complaints such as delay or rude treatment. From the relevant Act, the chain of authority is traced to applicable regulations, orders in council, ministerial orders, policies and guidelines. If applicable, investigators look to see how tribunal members are appointed and whether the decision-maker has properly delegated authority and how that authority was established. Enabling legislation such as the Government Organization Act is also reviewed as it establishes the authority to create programs, delegate powers and duties, enter into agreements and establishes advisory boards/committees/councils. In most cases, a tribunal’s enabling legislation will state the Administrative Procedures and Jurisdiction Act applies or that the tribunal falls under the requirements of the Administrative Procedures and Jurisdiction Act by virtue of a list of the Regulations. An inmate complained his application for a temporary absence pass was denied. The Temporary Absence Appeal Committee form stated: “Your appeal has been considered by the Temporary Absence Committee. The decision of the Committee is final and binding pursuant to the Temporary Absence Regulation.” In the course of the investigation, the Alberta Ombudsman’s office requested a copy of the Temporary Absence Regulation. Several days later, the department contacted our office to report there was no such thing as a Temporary Absence Regulation. No one could explain how this reference to a “phantom” regulation was incorporated into the form. An Alberta statute states a department may collect any overpayment of benefits. However, at one time the department’s policy stated staff must collect overpayments. This incongruity was carried forward into the application form where applicants were required to declare that they understand if they receive benefits to which they are not entitled because of the department’s administrative error, the applicants will have to repay the benefits to the department. a substantial effect on the individual’s rights (i.e., loss of financial benefit or a right to continue in a profession or employment). Where there is an opportunity for a decision to be reviewed, the Alberta Ombudsman’s office looks for a meaningful review process as well as an opportunity to present arguments or to be heard. For example, a government employee’s decision in response to a citizen’s request may be communicated differently from the decision of an administrative tribunal. The Maintenance Enforcement Program frequently communicates with clients through email due to the high volume of interactions with clients. An email response in some situations is deemed sufficient and administratively fair. In other situations, email is inadequate and therefore unfair. On the other end of the spectrum are those decisions made by administrative tribunals which are “final and binding and have a substantial effect on an individual’s rights.” The Citizens’ Appeal Panel and the Appeals Commission for Alberta Workers’ Compensation are two prime examples of where the Ombudsman would be looking for much greater procedural protection and greater duty of fairness, such as adequate written reasons and full opportunity to present arguments. An inmate was found guilty by a disciplinary panel of creating a disturbance or inciting other inmates to create a disturbance and was sentenced to time in disciplinary segregation. The inmate alleged he was not allowed to present his case because the disciplinary panel would not let an inmate in the cell next to him give evidence. One woman was attempting to appeal the amount of her social assistance overpayment. Each time she wrote to the department requesting an appeal she was denied and her file was instead forwarded to the Fraud Unit for investigation. A committee, created in a regulation, sought and obtained an expert medical opinion which it used in making its decision to deny benefits. The committee never provided the medical opinion to the complainant. Some statutory tribunals have written decisions which only discuss the arguments they accept. They do not mention or weigh the arguments they reject. The individual is often left to question how or why the tribunal rejected his/her argument or whether the argument was even considered. The Ombudsman maintains that adequate reasons must explain the weight given to all arguments put before the decision-makers. A complainant, who owed money under the Maintenance Enforcement Program (MEP), wrote MEP asking whether it was appropriate for support payments to be collected. This was in reference to a child who had turned 18 and was no longer in full-time attendance at school (no longer a “child of the marriage”). MEP made inquiries and determined the child was still a “child of the marriage,” but never replied to this complainant’s inquiries. This refers to the relationship of the decision-maker in dealing with issues and the parties in a specific case. It covers impartiality and independence. For example, despite policy to the contrary, one of the members of a disciplinary board at a correctional centre was also the officer who charged the inmate. There is no independence when a decision-maker is ruling on his/her own decision. Independence also extends beyond the state of mind or attitude of the decision-maker and involves a status or relationship of the decision-maker to external forces. For example, a client complained a former business partner sat on a committee that denied him a financial benefit. The investigation determined the former business partner actually removed himself from the decision-making process involving the client. Although the investigation found no evidence of bias, it was determined there was no conflict of interest policy to aid the committee when faced with questions about conflict of interest. The investigation looks for evidence of commitments or regular procedures of the decision-maker. If a decision-maker makes a commitment that a certain procedure will occur and it does not, the decision-maker should be required to fulfill the obligation as long as it does not interfere with a statutory duty. Failing to meet legitimate expectation in decision-making may be as simple as an official failing to follow through after agreeing to take a certain action; it becomes more complex if the authority fails to follow what may be considered a regular procedure, resulting in an individual being treated in an unfair manner. The Citizens’ Appeal Panel upheld a department’s decision to terminate benefits because of non-reported income. Under the facts considered was “the appellant did not claim potential income by selling marijuana. The appellant was arrested and had no trouble coming up with the $1,000 bail.” This statement was an irrelevant, improper factor to consider and a breach of the right to be presumed innocent under the Criminal Code and the Canadian Charter of Rights and Freedoms. The existence of criminal charges or a criminal record is also irrelevant to entitlement to social assistance. The Ombudsman is not a substitute decision-maker. Although not out of the realm of the Ombudsman to review the merits of decisions, such action is rare. Basically, only in those instances where an investigation determines there is absolutely no connection between the evidence presented and the decision rendered does the Ombudsman consider the merits of the matter. It is not the Ombudsman’s role to question whether a decision is right or wrong but only if it is reasonable, based on supporting evidence. A reasonable decision should indicate how the decision-maker considered and assessed the arguments and evidence. If this does not appear in the decision, the complainant is left questioning how his/her circumstance was considered.